This is a debut novel by a good friend of mine who decided he’d try his hand at writing fiction … and started with nanowrimo. (Is there anything this guy can’t do?) Here’s my take on his successful attempt. Jamie Simons is on the fast track to achieving his life-long dream – racing in the world famous Tour de France. But when he discovers that the world of pro cycling is darker than he imagined, Jamie must choose between compromise and abandoning his future. Now I’m not much of an athlete. Anyone who knows me at all can tell you that’s a massive understatement. Trevor, on the other hand, is a real-life cyclist/endurance runner, and somewhat of an expert on the subject. But in this book he strikes a perfect balance between immersing the reader in an accurate portrayal of the sport and explaining the basics to the uninitiated. His story is brilliantly paced. His prose is accessible but intelligent. And he draws on universal themes and emotions that anyone can relate to, not just extreme athletes. I particularly enjoyed his dry wit and vivid (but not overdone) descriptions of a wide variety of places and events. Overall I’d recommend The Long Run to anyone who’s looking for a quick, satisfying read – plenty of substance but never too heavy-handed. Thanks for the kind words, Erin! Thanks for the review Erin…sounds like a good read! 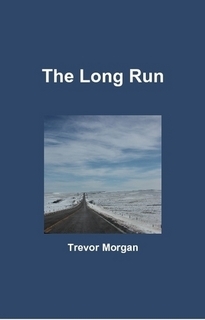 Oh, and you can get the book at http://www.lulu.com/shop/trevor-morgan/the-long-run/paperback/product-20989980.html, if it’s ok to shamelessly promote myself here! lol of course it is!